Not that this hasn’t happened before, but this time I was purely a spectator. The other day while out at the sometimes-more-casual-than-I-would-prefer Moose League (actually not a league – just sounds good), I was coming off court and noticed about four or five players debating whether or not two different sets of balls were dead (no longer suited for play). We are never lacking for near-fresh balls or a new can with so many players playing different leagues, clubs and all over town. This is why I stood back and observed such a meeting of the minds and these various testing methods. If in league or tournament play, when a fresh can is cracked open just before play, I usually don’t question the liveliness of the balls, but if they don’t have that pep or seem defective, I most likely will bring this up during warm-up. I don’t want to be the one in the middle of a set to make mention of this, nor do I want my partner or opponents to do so if playing doubles, particularly if the one to opine is well behind in score. Unless all parties agree, “I think there is something wrong with these balls.” throws up the big question mark and you get pinned back ears on the (most likely to disagree) leading opponents. If playing in other situations (weekend warrior, pick-up or friendly grudge matches), most would come to agreement about the worn condition or near deadness of a ball. In fact you may have even begun the match or set with anything other than a new can of balls. Frankly I hate changing balls in any given set and why I like to feel confident from the get-go. There’s nothing like hitting with new, but old friends (the balls) and then having to switch over to a completely new bunch of guys you don’t quite know, particularly well into a set. Back to the debate: A few players were bouncing the balls in question off their racket or bouncing them off the court with same. Another was hitting a ball against the fence with this awfully discerning look on his face and another was dropping the ball to the court from various heights almost as if willing the ball to come back to life. If you are between 5 and 6 feet tall and hold the ball in your hand with arm fully extended upward, while standing, and release the ball, it should bounce back above your hips, meaning it’s more than ready, willing and able to get back on the court. And no, don’t do this on the grass outside the court or along the fence line on a clay court. Here is the info from the ITF and a very exciting (not really) video. To me, if the balls are dead and you have no others (poor planning) available, then you’re done or you play on. 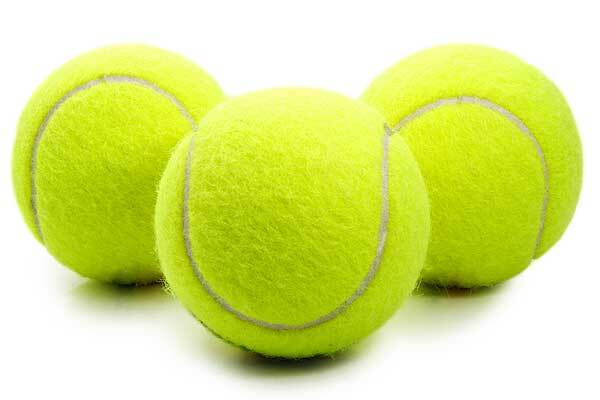 Just act like many people who have never played tennis before and assume those darn yellow things stay spunky forever. I know you’ve seen that first-time couple (must be that Love thing) a few courts over coming out with two-year old used tennis balls slightly larger than a racquet ball. So arm yourself with some knowledge and a little ball-dropping technique for the next time you are on-court and the ball liveliness discussion goes over 30 seconds. Newton already took care of the whole gravity issue and unless you want to break out some Calculus, it’s not worth the time.